Nathan Damigo is a leading white supremacist and a student at CSU Stanislaus in Turlock, CA. He spent 5 years in prison for carrying out a violent hate crime and has been documented putting up neo-Nazi stickers at his college. On Saturday, April 15th, he attacked and beat up someone during the pro-Trump rally in Berkeley, CA. Call both the Dean and President of CSU Stanislaus and demand that they expel Damigo now! Enough is enough! Damigo has got to go! 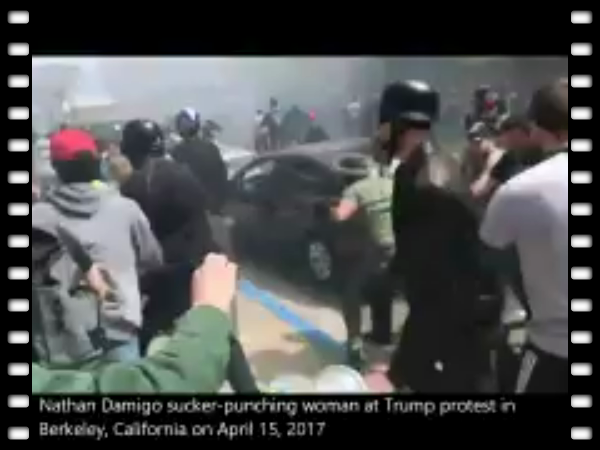 On Saturday, April 15th, in a video clip that has now gone viral, neo-Nazi organizer Nathan Damigo is seen violently attacking and punching an unarmed female bodied person during the pro-Trump protest that was organized by members of the Alt-Right in Berkeley, CA. Soon after, Damigo gave an interview in which he stated that African-Americans are "genetically inferior to whites." Damigo became a white supremacist after reading a book by the KKK leader David Duke while he was in prison for pulling a gun on a middle-eastern cab driver. Once out, Damigo became the leader of the Nationalist Youth Front, a neo-Nazi group. After that organization fell apart, Damigo rebranded the NYF into the group, Identity Evropa, under the direction of Alt-Right poster boy and leading white supremacist, Richard Spencer. Nathan Damigo currently attends CSU Stanislaus as a Social Studies major and the current administration on the campus is very aware of Damigo's racist views and his violent history. Damigo has also documented Identity Evropa stickers that he has placed up around the school, yet the administration has refused to do anything about the vandalism. Damigo even once followed and harassed a student of color to their car, yet when the incident was reported, the administration did nothing. Damigo is planning to use his career after graduating to advance the white supremacist movement. Call CSU Stanislaus and demand that they expel Nathan Damigo from the campus. He has harassed fellow students, he has vandalized the campus with neo-Nazi stickers, and he is prone to violence. Enough is enough!